MPI continues to revolutionize the technology of producing and processing patterns and cores with the introduction of a full line of automated injection cells. MPI automated injection cells allow you the flexibility to make patterns or cores from the simplest commercial parts to complex patterns or cores required by the medical and aerospace industries including single crystal turbine blades. By combining the highest levels of automation into our SMART injection systems, MPI is able to consistently produce high-quality, high-volume patterns and cores. These self-contained automated injection cells are equipped with an MPI injector, pattern or core conveyor, automatic tool change station, and a 6-axis robot, and any additional stations required for your process, such as part marking, reforming, etc. The automated injection cells also feature MPI’s Smart Controls™, providing the operator with intuitive, user-friendly access to the cell central process controls. 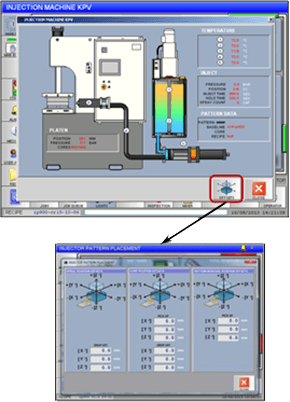 MPI engineers have integrated the robot controls into the operator’s interface terminal OIT so operation of the automated inject cells does not require any robot programming knowledge. A typical operator can be trained to run these cells in one day. 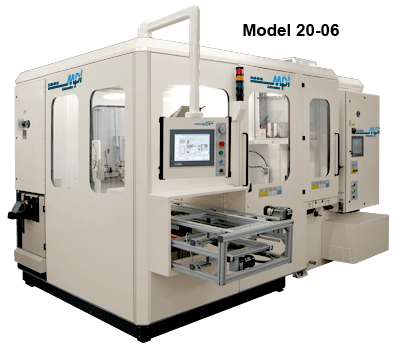 MPI has incorporated the best process controls into every automated function for example, inserting ceramic cores, injection and pattern removal, pattern or core setting, injection runner trimming and inspection, and more. The robotic end-of-arm tooling on the automated injection cells have also been specifically designed for automation and allows for rapid tool changes from a tooling library. 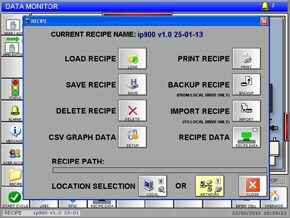 Smart Controls™ are capable of converting all cell parameters into easy-to-access recipes that can be operated by typical wax-room personnel. Versatile 6-axis robots can easily handle any pattern or core. Intuitive Smart Controls™ ensures consistent results with virtually no supervision. Robot programming knowledge not required to run the cell – operator can be trained in one day. Automated tool change allows for job changeover in less than a minute. Automatic tool ID ensures the tools picked by the robot match the product being injected. Standalone system can be integrated into a fully automated wax room. Optional bar code reader allows simple loading of recipes. The benefits of automation are undeniable; by eliminating process variation, including operator variation and providing accurate process control you will not only see substantial increases in terms of productivity and uniformity, it will have a dramatic impact on profitability as well. 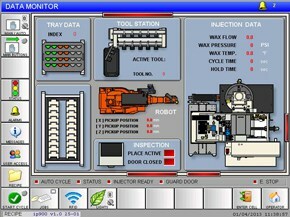 All automated injection cells are equipped with MPI’s intuitive Smart System Process Controls. This system allows you to monitor all aspects of the system during operation. The controls are also the access point to all other critical data and machine functions. Come to MPI and experience Automation and learn more about your ROI opportunities in our Tech Center. The team at MPI would love to have you come visit our facility in New York, tour our plant, see automated wax injection and automated pattern assembly in person, and begin the process of looking at how we can apply these best practices to your wax room. Learn how repeatable pattern injection and pattern assembly can dramatically impact your scrap rates, throughput and casting yields, all of which shows up in your bottom line. Call today for details and to schedule a trip!